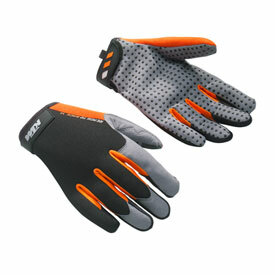 KTM logo on adjustable TPR Velcro® fastening at wrist. READY TO RACE lettering on the upper side. Can be used with touchscreens. These are great comfortable gloves. They do offer some protection from those chilly morning rides but they won't help to much on real cold days. They fit well and don't have any annoying seems that sometimes bother me in the thumb area. I use for riding in even 90-100 degree temps, they fit so ergonomically and performance is outstanding.